I love the old fashioned hats and fascinators from the 50's and 60's. They are so lady-like, so pretty and just beautiful! 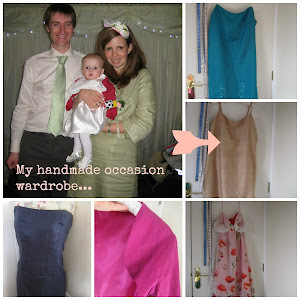 Today I wanted to share with you some current makes and what a vintage fascinator means to me and the three steps to making yours! 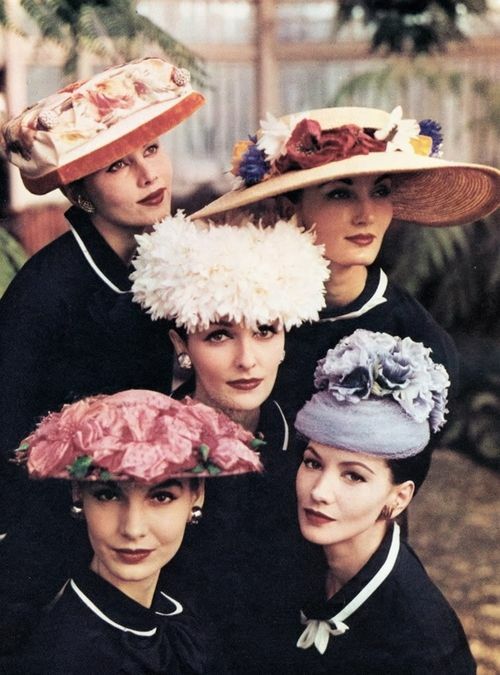 I love looking through Pinterest and finding inspiration from the hats worn in the period. I could loose hours and hours just scrolling! Yes, these are a little large for modern life but the ideas of adorning with fabric flowers in subtle colours is a great idea source. 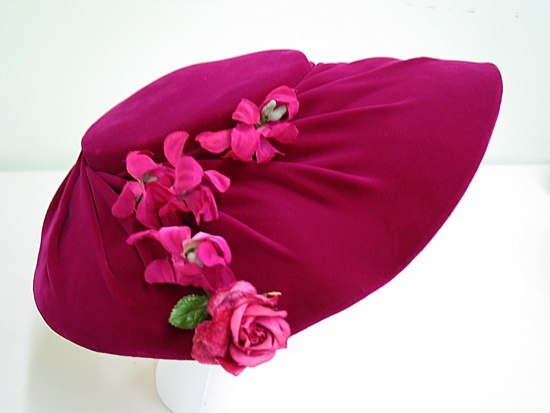 I love this 1950's hat in bright pink with faux silk flowers trailing down the sides. And with these sources I have designed a few fascinators to reflect the period. This pink net and silk floral creation was made to show how the 1950's and 1960's trend for big hats and bright colours can be translated into a smaller fascinator to be worn for a hen party or Wedding. I always use odd numbers on the my fascinators and in my Crafternoon classes you can make one just like this! I always try and use vintage buttons in my makes, these I found a few weeks ago at a vintage fair and teamed up with pearls would look great. Above is a work in progress from my desk last week. 1. A fabric covered base to look like the hats and fascinators worn at the time. Covering with net or pleats add an extra vintage point or two! 2. Net to add that finished polished look. Adding widow's net or netting either on the fascinator or just peaking out from the base is oh to pretty! 3. Flowers either silk or handmade fabric flowers. You can't beat a flower or two for that retro touch. 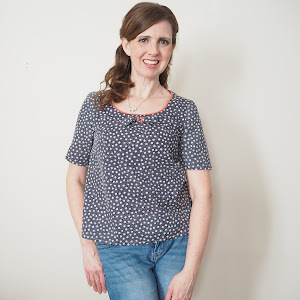 Add net to your make to give that retro touch! I'm really lucky to have my Mum around to tell me all about fashions from the era and I check everything through her, the colours, the shapes and the decorations. Currently I am preparing for a vintage fascinator making Crafternoon Tea Party in a few weeks time. 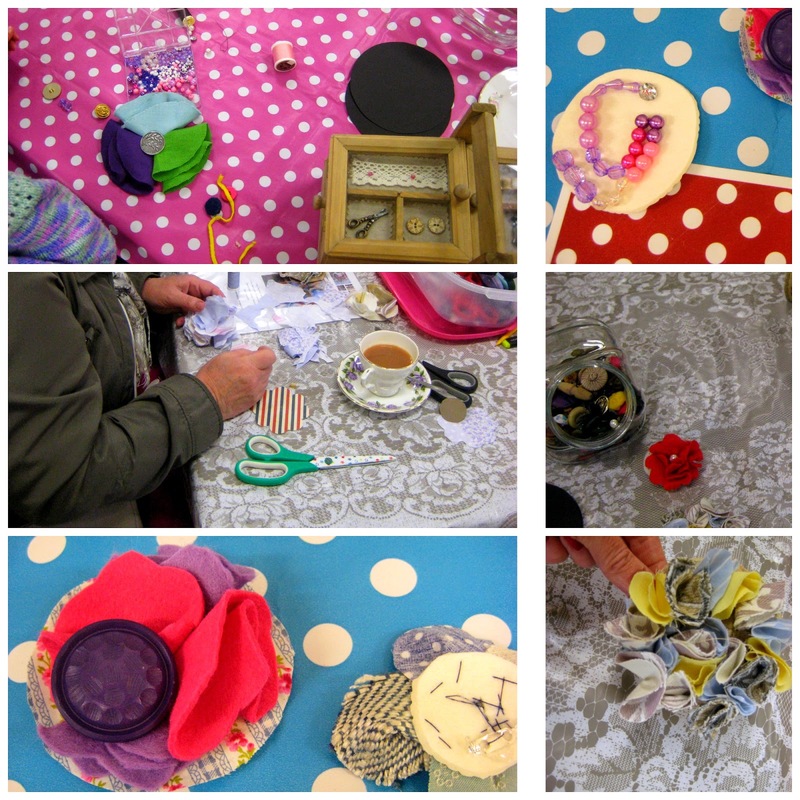 Over the Easter weekend I was hosting a 1940s Crafternoon Tea for the build up to the Vintage Weekender at Crich Tramway Museum in Derbyshire. Over the three days at Crich, we made over forty five pretty corsages inspired by the Make Do & Mend 1940s rag rugging techniques. 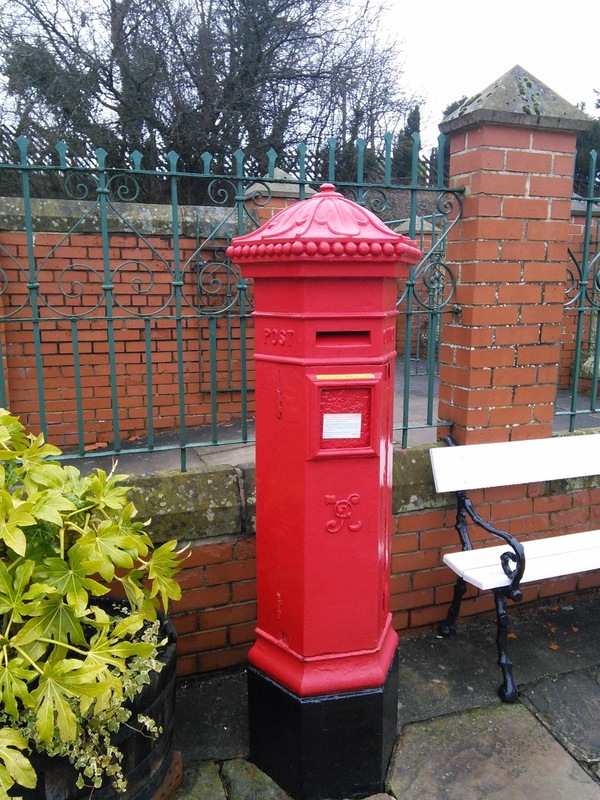 Crich Tramway Museum is like stepping back in time, from when you walk into the museum you are on a 1940s street with an old post box, signs, buildings and tramlines. Really quaint and the perfect backdrop to a Crafternoon Tea. 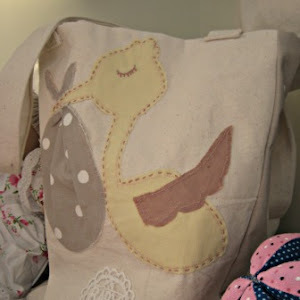 I love vintage crafts, the kind of crafts you don't see anymore and rag rugging is one of them. The craft was developed as a need to make warm flooring for post War living. 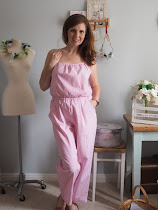 It uses scraps of fabrics which are bunched up and sewn or hooked using a tool similar to a crochet hook into a mesh. This technique was mainly used for matting or rugs. For this Crafternoon we were being inspired by it to make corsages. These are the pictures that inspired the Crafternoon. Using scraps of fabric to make designs to add to the rugs. We made using the vintage fabrics I had bought along and with the vintage china and cake, crafted away through the stashes of pretty fabrics. I love the fact that this lady wanted to model hers. 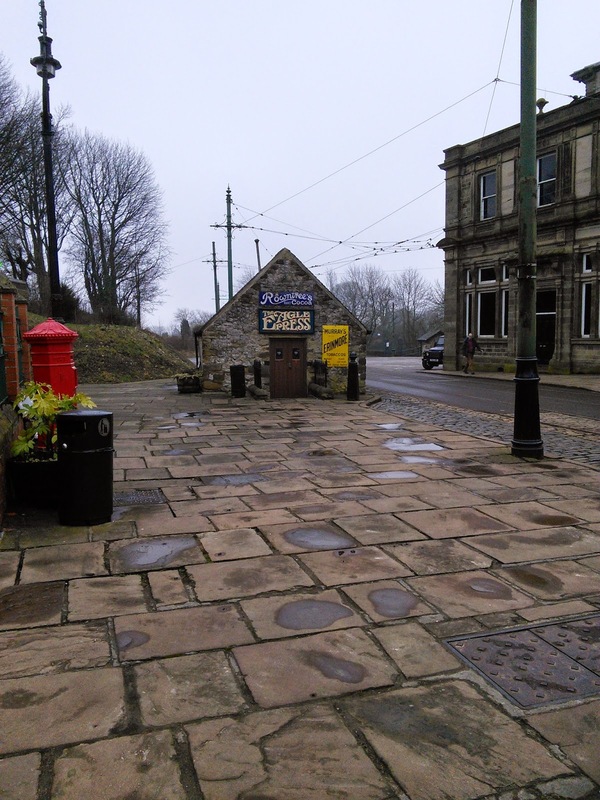 I really enjoyed my time at Crich Tramway Museum and want to thank the staff for their support for the Crafternoons.